This list is in progress. I still have to discover more stores. Diese Liste ist noch nicht fertig. Ich muss noch mehr Handarbeitsläden in Berlin entdecken. Read more about what this Australian blogger has to report about her flea market experience in Berlin! 11. 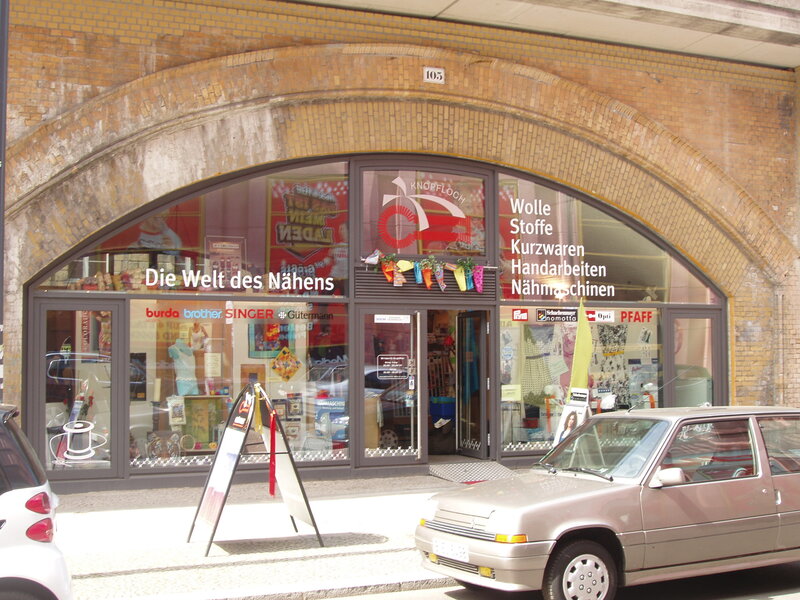 Wollen Berlin – I will still have to visit this shop. Go to S/U-bahn Warschauer Straße. I would walk from there then turn right to Revalerstraße, up to Modersohnstraße. Turn left and walk one block. The Moderstraße will change to Gärtnerstraße. Go to Alexa Shopping center at the famous Alexanderplatz and out the south exit/entrance. The Knopfloch (“Buttonhole”) is located under one of the arches of the train rails of the S-Bahn. They have a lit bit of everything here. Knitting, sewing, patchwork, embroidery. There are also rare Clover items. Get off U-Bahnhofe Oranienburger Straße Station. Auguststraße is near that station. This yarn shoppe has lots of luxurious yarns and knitting supplies. I especially like those from japan. They have displays of finished knitted items but I especially liked a kimono-style jacket, in black with red accents–it made me feel like making knitted clothings that is not a sweater or shawl. 3. 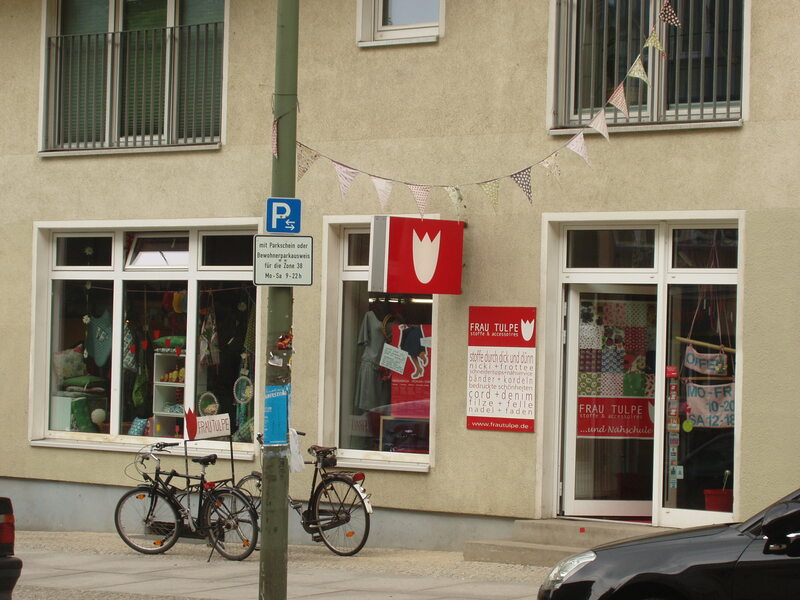 Idee shops – These are all over Germany´s largest cities. In Berlin there are 2 branches. Go to the Passauer exit/entrance. The shop is at the basement while the workshop/courses at the 1st floor near the entrance. They are renovating the yarn and embroidery section. This store has everything from textiles and needleworks to papers and art supplies to office supplies and scrapbooking. b. in Kant-Center at Wilmersdorfer Straße 108-111 (you can see the idee logo on the lower left of the picture). They do not have fabrics here and limited yarns too. 4. Hobbyshop Rüther – There are 4 shops in Berlin. The Main Shop is at Goltzstrasse 37 in Berlin- Schöneberg and is near my apartment. It is composed of 4 different shops: the main house (office supplies, needlework, handicrafts books, etc. ), the Bead shop, the ceramic store (clays and oven for rent) and an art store. The other shops are off Berlin Center. Berliner Straße 90/91 in Berlin-Tegel. I have been here once but I should say compared to the main stores, this store is small and very limited. and in Breite Straße 30 in Berlin-Spandau Altstadt. This store has lots of yummy printed fabrics, like those from Japan. They have an online shop and you can see more of the prints there. Their affordable sewing courses are famous, they are fully booked til summer this year. 6. 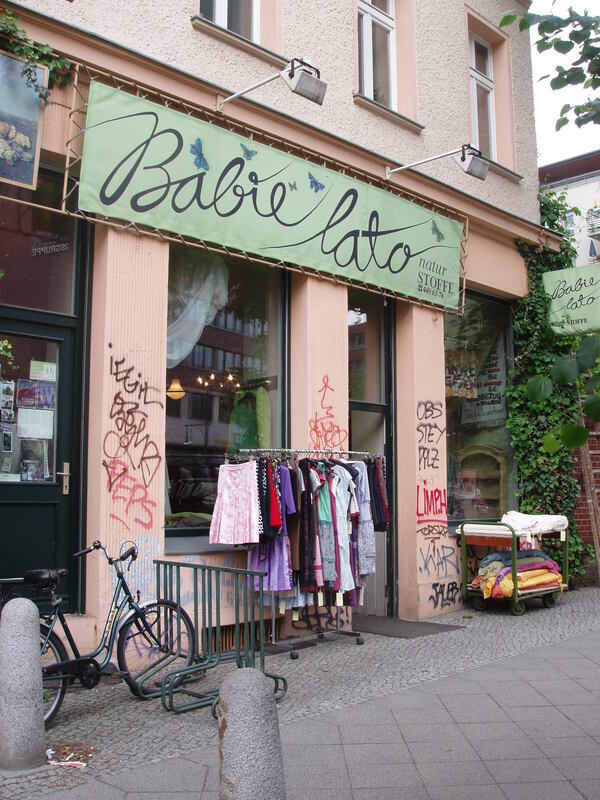 Babie Lato – Schönhauser Allee 182a near U-Bahnhof Rosa Luxemburg Platz. This store has natural fabrics like linens, cottons, silks. They have lots of rare fabrics here and the price is great. They also have fabrics for curtains. 7.Werken Spielen Schenken – Schloßstraße 110b near U-Bahnhof Schloßstraße. It has Toys, Crafts(includes needlework supplies) and Art Supplies departments. And they have an eatery if you get hungry. Thanks to Anita of stitchalicious for sharing this store. This looks really like the world of textiles. Thank you to Marie for the link! 9. Die Klöppelstubbe is a bobbin lace store in the Nikolai are in Berlin, near Alexanderplatz and the City Hall. They celebrated 10 years of existence in 2010. Look for the owner, Ilona Kühn. They also offer courses. There are also souvenir items from the Erzgebirge for tourists. Wait, you’re in Schöneberg? Then we’re really close to each other (I’m at Bayerischer Platz)! We HAVE to meet up for coffee! One other one is the Werken Spielen Schenken in Steglitz (U-bhf Schlossstrasse). Go through the toy bit (and through some more) and out the back on the right side of the store is the entrance to their crafty section. They’ve got only anchor threads and Aida, but do sock quite a bit of wool and more and more felting supplies. They also have lots of other stuff for other crafts as well. I am making this list, just drop me a note if you discover more stores or even galleries/museums with textiles. Thank you for that address. I will go check it one of these days. I was in Rosa Luxembourg Platz today and discovered 2 fabric shops. They are little fabric heavens. lol! Hi, got to know about your site from a friend of a friend who mailed me your list of fabric and needle work shops. Am very impressed with your embroidery. I only do hardanger, and quilting. How long have you been here? What made you come here? I have been here for 17 years now. Supposed to be quite good. Hi Marie! Thank you for the comment. I have been here since 2003, almost 7 years. I want to study and work here. Thanks for the link. You do Crazy Patchwork? I have not seen one in real life. lol. yes, I do love crazy patchwork but mine is just the use of common fabrics, mostly scraps, of different type of materials, usually make some small items and sell them to a few friends who want them to support a medical mission in the Phil. I also live in Berlin, maybe we can hook up one of these days. Were you able to see the exhibition of Working Mom in Schloss Charlottenburgß I missed it so went to the exhibition of Die Kleider die Königin in Schloss Paretz. A bit way out but also quite a nice area. I did a Google search for needlepoint stores in Berlin & came across your blog. I’m only here for a couple of days but am looking for a store that sells printed needlepoint canvases (I will get thread when I return to the states). Do any of these stores sell such things? If not, do you know where I could find something like that? I will be using public transportation and am staying close to KaDeWa. Thanks so much!! Do any of these shops in Berlin carry cross stitch patterns or books? I’m especially looking for Christine Dahlbeck books. I’m not in Berlin (lived there many years ago), but some of my family will be there in July. I was wondering if anybody here knows a place where I could learn Crochet. I know basics. I would love to learn the proper way. I am coming to a conference in Berlin in July & stumbled on your site since I am a knitter & quilter. Thanks for the ideas! Thank you very much for the list! It is quite helpful! I cannot wait to explore more stores in Berlin! There is one store I can contribute to the list above! It’s a store called Wollen in Friedrichshain. small, but it offers a class and kids friendly store! Well I am coming to Berlin and started to look around for shops that sell lace as in lace curtains – more old fashioned similar to those I have seen in jewish areas. Still have not found the curtain shop, just got too interested in what you all have to say. I enjoy crazy patchwork/knitting and all sorts really so this is lovely information. Thank you all who have contributed! Anybody here know where I could buy a ball winder for my knitting yarns? Actually, I live in Doha, where there are none to be found, but my husband is going to Berlin and has agreed to hunt one down. Please help!! Hi! How about trying to contact or visit the shops mentioned in this post, once your husband is in Berlin. The german name is “Garnwickler”. Those made of wood cost 90€ and above. Then there are those made of plastic which cost 10€ and above. You can also try ordering in ebay or amazon. HI, I wanted to ask if you knew anyone who could finish a quilt. My wife has all the prep work done she just needs someone to sew the boarders. It is a square 130cm each side. Please leave me a note at joh_way@yahoo.com. Thanks and great site!